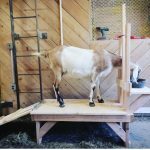 Learn how to build a goat milking stand or stanchion in today’s video! We had just purchased our first dairy goat. K wanted to milk goats, and I wanted to drink goats milk. In just a few weeks our doe would Kid. K would spend each morning peacefully milking her new doe, and I would be enjoying farm fresh goat milk, a real treat for new homesteaders! Actually, about 2 days into milking the dairy goat K stopped. It was impossible. We had not built a milk stand to secure the goat. K was milking off the ground, with the goats neck tied to a fence post. The goat moved and kicked the bucket constantly. K couldn’t get a grip on her teats. No milk was collected. I never enjoyed the cup of farm fresh goat milk. 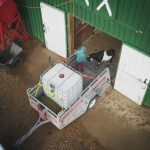 WE NEEDED A GOAT MILKING STAND! If you are planning on getting dairy goats you will want to have a milking stand ready for day one of milking! Milking a goat is much easier when the goat is properly secured, and elevated off the ground. In todays video we demonstrate how to build a goat milking stand out of 2x4s and 1×8 inch pine boards.